When Francisco Reyes, Jr. was in college his Plan A was to make it as a musician. His Plan B was to be a graphic artist. Francisco Reyes, Jr. (Never Made) and streetwear producer “The Hundreds” announced their collaboration on Friday evening. The event was held at the Ice House. Photo by Bill Alkofer. But then he landed a dream job, an internship with Shepard Fairey, the icon of the iconography world. 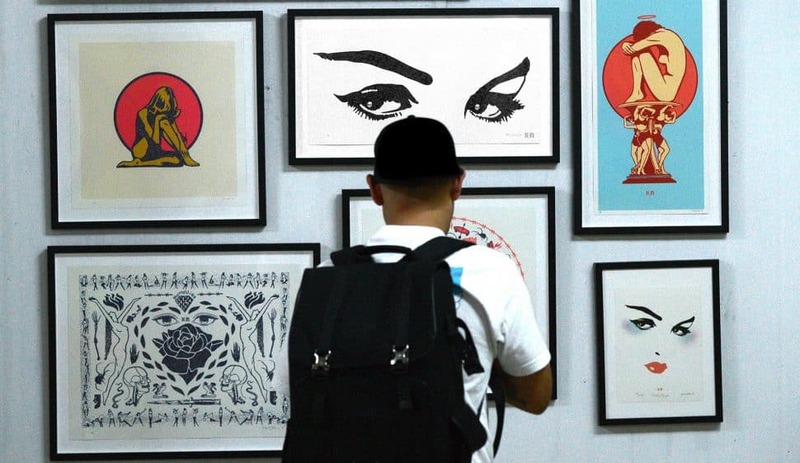 Even if you’ve never heard of Shepard Fairey, you’re familiar with his work. He’s the guy behind the ubiquitous “Obey” logo and the “HOPE” poster that helped Barack Obama get elected to the highest office in the land. Reyes has now been working with Fairey for seven years. More than 100 graphic arts and music fans showed up for the announcement and concert at the Ice House on Anaheim Street, which has quickly become one of Long Beach’s premier art spaces. Mia Go and Jane Delgado pose for a picture at the Ice House on Friday. 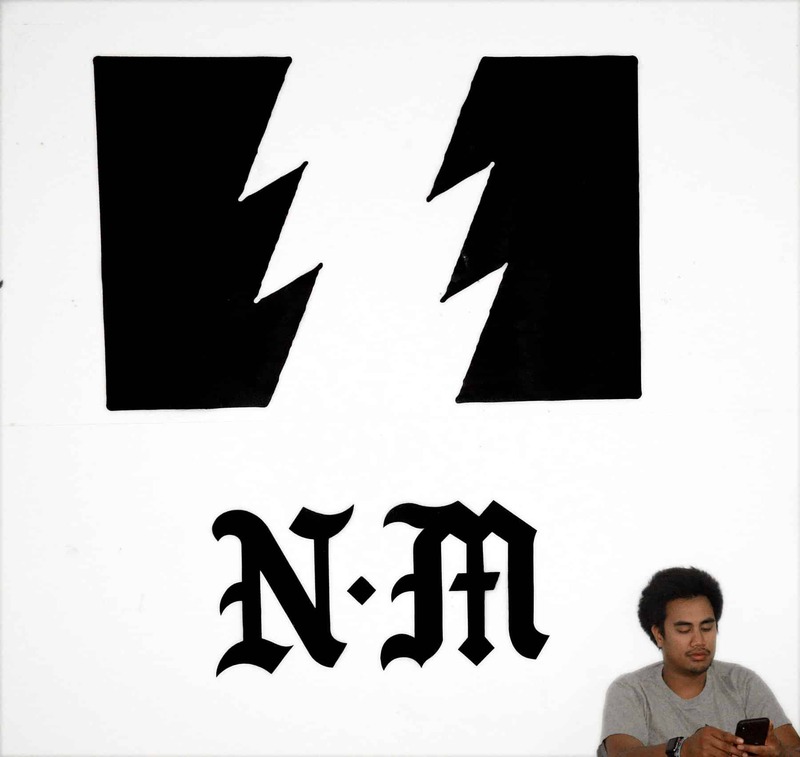 Streetwear producer The Hundreds announced a collaboration with Long Beach graphic artist Francisco Reyes, Jr. (better known as Never Made). The collection is called “The Hundreds X Never Made.” Photo by Bill Alkofer. Not that his reveries always make sense. A member of the Never Made team looks at a piece by “Art Chemist” at the Ice House on Friday. 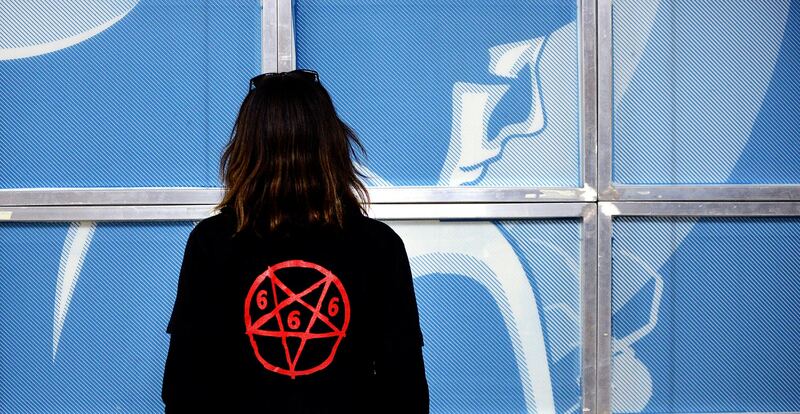 Streetwear producer “The Hundreds” announced a collaboration with Long Beach graphic artist Francisco Reyes, Jr. (better known as Never Made). 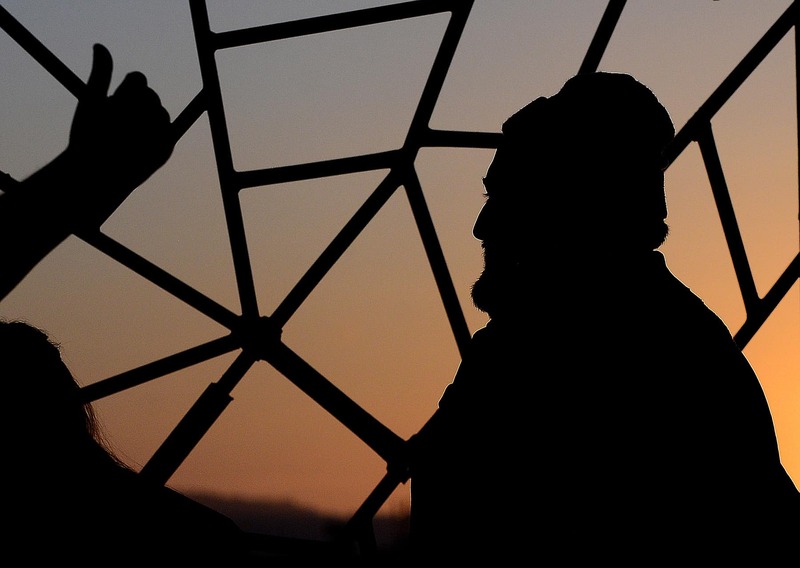 Photo by Bill Alkofer. Graphic art by Francisco Reyes, Jr. (better known as Never Made) was on display at the Ice House on Friday night. 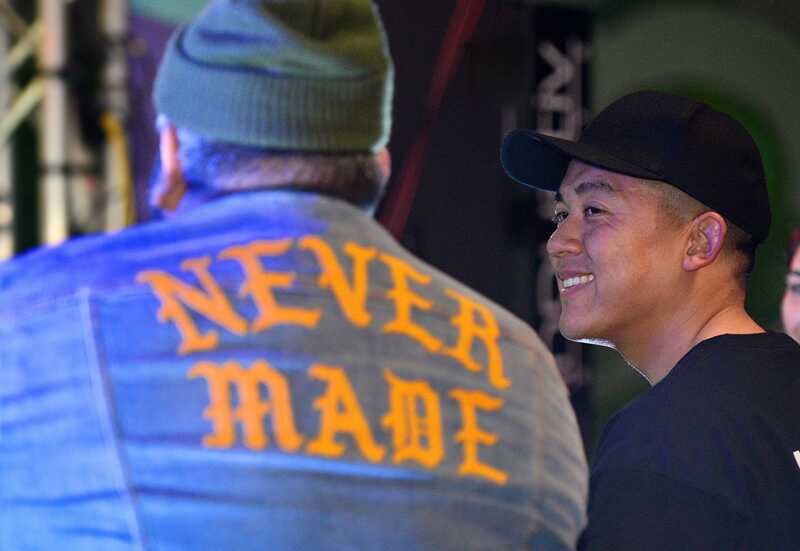 Streetwear producer The Hundreds announced a collaboration called “The Hundreds X Never Made.” The event was held at the Ice House on Friday. Photo by Bill Alkofer. 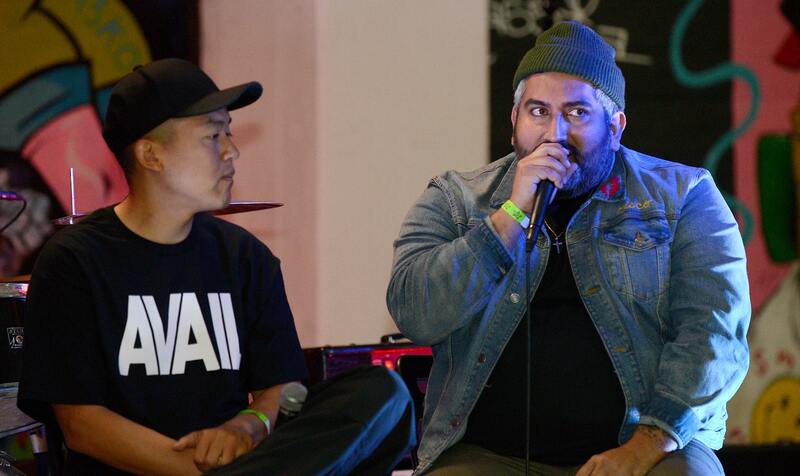 Francisco Reyes, Jr., right, and streetwear producer “The Hundreds” announced their collaboration on Friday evening. The event was held at the Ice House. Photo by Bill Alkofer. The Never Made logo was on one of the walls of the Ice House on Friday. 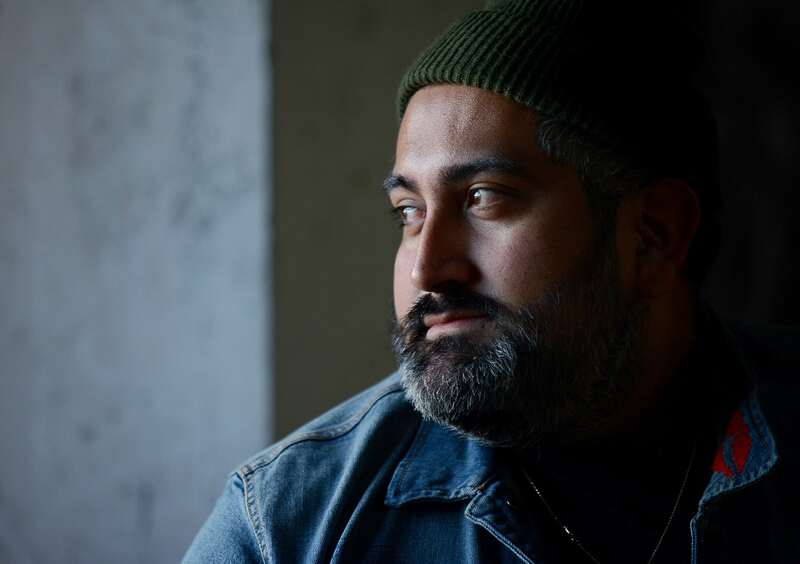 Streetwear producer “The Hundreds” announced a collaboration with Long Beach graphic artist Francisco Reyes, Jr. (better known as Never Made). Photo by Bill Alkofer. 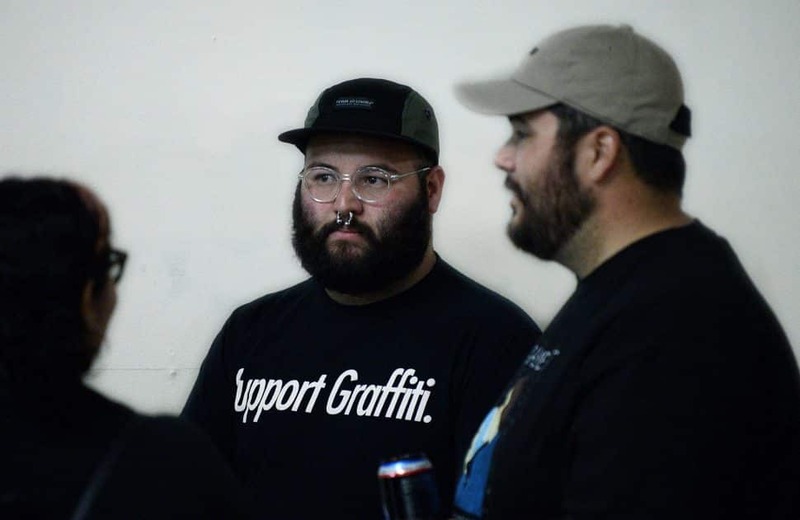 Graphic shirts from many artists were worn by those in attendance when streetwear producer “The Hundreds” announced a collaboration with Long Beach graphic artist Francisco Reyes, Jr. (better known as Never Made). The event was held at the Ice House on Friday. Photo by Bill Alkofer. A graphic arts fan looks at one of pieces created by Long Beach artist Francisco Reyes Jr. Streetwear producer “The Hundreds” announced a collaboration with Reyes, Jr. The event was held at the Ice House on Friday. Photo by Bill Alkofer. 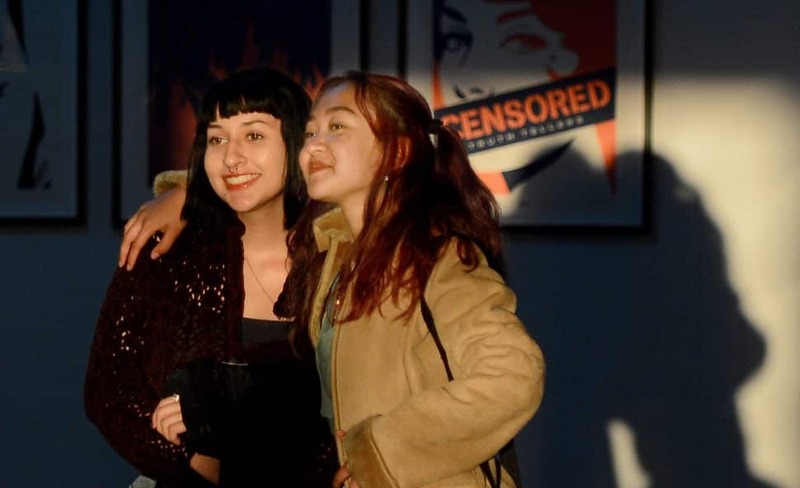 Emily and Elizabeth Navarrete stand in front of a piece by “Edrok One/Ron The Killer” at the Ice House on Friday. 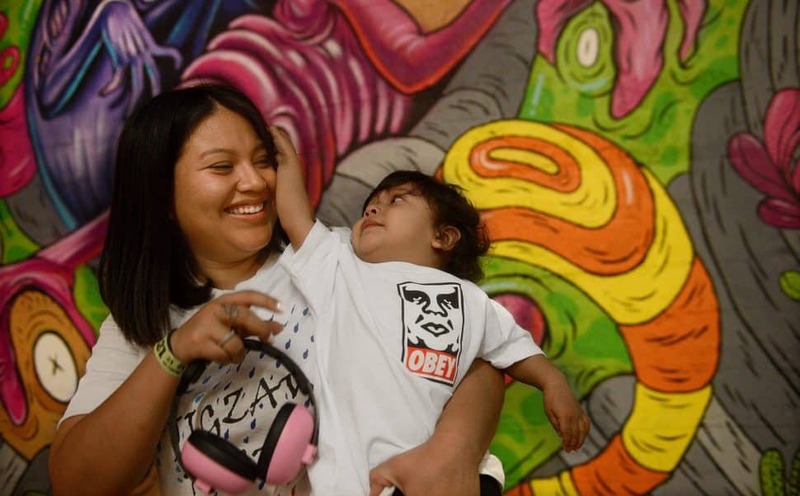 The toddler is wearing the famous “Obey” logo designed by Francisco Reyes’ mentor Shepard Fairey. The face is a graphic representation of pro wrestler “Andre the Giant.” Photo by Bill Alkofer. 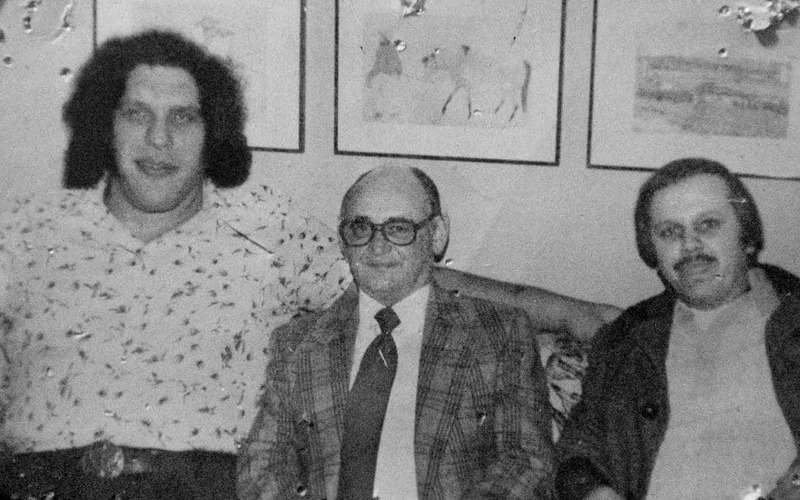 Here’s a 1989 photo of legendary pro wrestler Andre the Giant with legendary pro wrestling promoter Wally Karbo and legendary pro wrestling journalist Augie Augustin. Andre the Giant was the inspiration for the “Obey” graphic by Francisco Reyes’ mentor Shepard Fairey. Photo courtesy of Mike Augustin. Streetwear producer “The Hundreds” announced a collaboration with Long Beach graphic artist Francisco Reyes, Jr. (better known as Never Made). The event was held at the Ice House on Friday. Photo by Bill Alkofer. 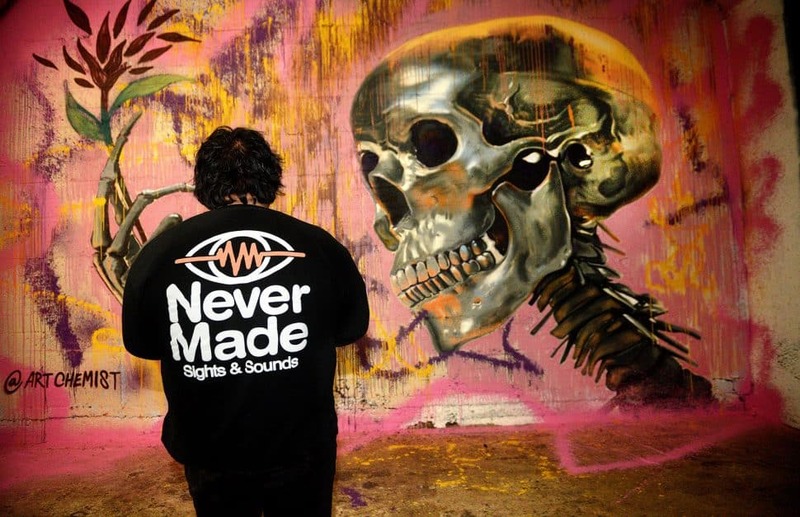 Josh Munoz was among those in attendance when streetwear producer “The Hundreds” announced a collaboration with Long Beach graphic artist Francisco Reyes, Jr. (better known as Never Made). The event was held at the Ice House on Friday. Photo by Bill Alkofer. Bobby Kim shared the stage with Francisco Reyes Jr. for the announcement of “The Hundreds X Never Made” collection. The event was held at the Ice House on Friday. Photo by Bill Alkofer.